In recent years bacterial strains of staph such as MRSA (Methicillin-Resistant Staphylococcus Aureus) and viruses such Hepatitis and Influenza, as well as other infections have become more common in schools, child care facilities and fitness centers. Many of these organizations do not have the equipment, staff or procedures to prevent and kill these highly contagious bacteria and viruses that can endanger the health of these infants and students. Wrestling mats, weight rooms, locker rooms, and shower floors have become a focus of concern since they are often shared by multiple users who are sweating from exercise and end up sharing and spreading the contaminated bio materials with their skin-to-skin and skin-to-contaminated-ground contact. Added to this are participants who use the bathroom and bring back additional bacterial contaminants on their shoes. The organizations that do address this issue and have an effective plan to prevent or attack these bacteria and viruses often do so with a variety of chemicals (including bleaches, chlorine, chlorine dioxide, and chloramines) which can themselves cause skin reactions or can react with the water / sweat that is often present in this environment to produce unhealthy gases or liquids, and can accelerate the ability of bacteria to grow more resistant to these chemicals. Even when used according to directions, organizational cleaning procedures can be infrequent, often inefficient, and ineffective. 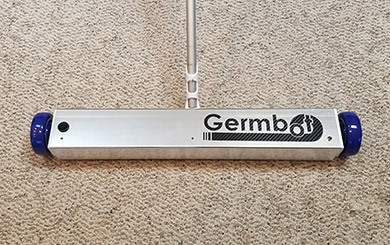 The Germbot™ is a battery powered floor sanitizer that can be used multiple times daily to kill dangerous bacteria and disable the reproductive ability of viruses - thereby improving the sanitation, health, and safety of the floor surfaces used by infants, students and fitness center members. UV light for sanitization kills bacteria by and disrupts the DNA structures of viruses. This technology has been in use for many years in medical environments such as operating rooms and similar clean room areas. The Germbot™ can be used on mats, weight room floors, low carpets, linoleum, cement and other floor surfaces. UV (Ultra Violet) light has a shorter wavelength than the normal light that humans can see. It is what we blame when people get sunburned which increases the risk of skin cancer. In moderate exposure UV can be beneficial to health since it stimulates the production of vitamin D and can kill harmful microorganisms. UV (Ultra Violet) light has been used for cleaning and sanitization in the medical field for over 100 years (the 1903 Nobel Prize for Medicine was awarded to Niels Finsen for his use of UV against Tuberculosis bacteria). UV produces short wavelengths of light that damage and kill micro-organisms. Instead of using costly and sometimes dangerous chemicals - UV light can be a great alternative to kill bacteria on floors – especially when there is no exposure to humans. The Germbot™ is a combination of the convenience of a battery powered floor sanitizer with bacteria and virus disrupting UV (Ultra Violet) light. UV light produces short wavelengths of light that damage and kill micro-organisms. To prevent the UV light from causing potential harm to people, the Germbot™ has several safety features including a design that provides for a recessed UV bulb, metal casing to direct the UV light downward, and other safety devices that will turn the unit off if it is picked up. We have combined the sanitation properties of UV (Ultra Violet) light with an easy to use, highly effective and highly portable floor sanitizing device. It certainly can be harmful to humans that are exposed to UV light. Anyone who has ever suffered a sunburn has experienced how UV light can be harmful to skin. UV light will increase the risk of skin cancer with increased exposure (as shown by tanning bed restrictions in many states). To reduce the chance that UV light from the Germbot™ could cause harm, this product has safety features including a design that provides for a recessed UV bulb, product design to direct the UV light downward, and a safety feature that will turn the unit off if it is picked up. What happens if a unit is damaged / broken? The Germbot™ is fairly rugged but as with any electronic device it should be handled with care. If your unity fails to produce light after it has been charged - please contact our technical support for repair / replacement instructions. DO NOT open the metal case and attempt a repair. Can this unit be used with water and wet surfaces? It is not recommended. UV light works best when it lands directly on the surface (this is why it works better on short carpet than on long carpet. The UV light cannot cover every part of the surface of long / thick carpet fibers nearly as well as it does for the tops of short carpet fibers. The Germbot™ can be used on floors such as a locker or shower room or on wrestling / tumbling mats when they are dry and clean. Can this unit completely eliminate the use of chemical mat / floor cleaners? We position the use of the Germbot™ to reduce the use of chemicals instead of eliminate them. The addition of a Germbot™ to your cleaning procedure can provide for cleaner surfaces. Because the Germbot™ is easy to use and can be used multiple times each day (after it has been recharged) it can enhance your efforts to keep these areas cleaner and help make sure that the cleaning really gets done in your facility. Who developed the Germbot™ and why? The Germbot™ is the result of several years of work by an Iowa youth wrestling coach to help keep his athletes healthy by killing bacteria and minimizing the spread of viruses on wrestling mats and floor surfaces. UV is not a new “cleaning” technology and has been used in the medical field to kill bacteria for over 100 years. In retrospect, it’s hard to understand why this technology has not been developed and used before in this application. Does the Germbot™ kill all bacteria and viruses? We expect the Germbot™ to kill a significant percentage of bacteria and disrupt a significant percentage of viruses. The effectiveness of UV light depends on the wavelength of the light and the length of time the light is projected on the surface. We are targeting the Germbot™ at the most common / dangerous types of bacteria and viruses typically found in a school or child care environment. How much does the Germbot™ cost to purchase? The Germbot™ is being offered for $1295.00 at this time. The Germbot™ is a new invention and we expect to be making improvements to future versions as we receive feedback when they are used by our customers. Is the Germbot™ safe to use? To prevent the UV light from causing potential harm to people, the Germbot™ has several safety features including a design that provides for a recessed UV bulb, skirting to direct the UV light downward, and a trigger switch that turns the unit off if it is picked up. We have not had our attorneys develop a mumbo jumbo agreement warning that the Germbot™ could be hazardous to your health if you continually smash it into your head into it or similar nonsense warnings. With the lawsuit crazy world we live in, it’s possible that we will do this in the future. For now, if you don’t do stupid things with the Germbot™ it should be safe for you to use. The Germbot™ works on most surfaces we have tried it on. It will work better on hard flat surfaces than on deep soft materials. It may not work on some thick mats that are very soft without modification of the drive wheels. The light needs to land directly on the surface to be effective. How should I prepare an area – such as a child care room or tumbling mat for Germbot™ use? The floor should be dry and items like clothing or toys should be picked up off the floor. Depending on the surface being sanitized, you may want to wash the area before sanitizing it with the Germbot™. Can the Germbot™ damage surfaces? The Germbot™ uses UV light and just like sunlight can break down and discolor a surface over time; the Germbot™ may do the same thing. This is much more likely to happen if the unit is turned on, kept in one area and fails to shut off. We don’t think this is very likely but it is possible – so we recommend that a trained user operates the unit. Without specifically testing we will not know the impact on different surfaces. The life cycle of a tumbling or wrestling mat may be shortened by using the Germbot™ depending on how often the UV light is used and it may lengthen the life of these mats by allowing you to use fewer cleaning and sanitizing chemicals which can also shorten the life of your mats. Only long term use will provide the data to determine this impact. How do I clean a Germbot™ after use? We recommend using a germicide to clean the wheels and bottom parts of the Germbot™ that come into contact with the floor. This should be used on a regular basis depending on how often you use the unit. Use normal precautions with the cleaning – use disposable towels, dispose of them carefully, and wash your hands thoroughly with soap and water to remove possible any contaminated areas. Should I clean the Germbot™ UV LED's after use? Like any light bulb, the Germbot™ light bulb can be very fragile. Cleaning should only rarely be necessary under normal use. You can occasionally use a can of compressed air to remove dust buildup. What is the target market for the Germbot™? Because of the developers’ coaching background, initial units are targeted for use with school facilities - especially High Schools and Colleges. Other natural markets include children’s day care centers, elder care facilities, residential homes where “at risk” infants require a cleaner floor environment, and any facility that requires cleaner more bacteria free floors. What kind of customer are we looking for? The ideal customer for us is one who will use our unit consistently and provide feedback to help us improve our product. Science, common sense and our database of pathogens prone that the Germbot™ will have a significant impact on cleaning surfaces and keep our children healthy and safe. How can I justify the cost of a Germbot™? Our cost structure is designed to be affordable by offering this breakthrough technology at $1295.00. Organizations using a Germbot™ can save money (and have floor surfaces be healthier for human contact) by using fewer chemicals on your floor surfaces. In addition – the value of keeping your children, students, and athletes safer and healthier can easily justify the costs involved. How long will the battery last on the Germbot™? Battery life depends on the surface being cleaned, the number of times the Germbot™ hits a wall and needs to backup, how open the floor plan is (an area cluttered will take longer to clean than an open area), and how often you repeatedly clean the same area . Some customers have said that they use the Germbot™ for hours before it needs to be recharged. You should quickly learn how long the battery lasts in your environment. Please make sure the battery is fully charged after use. How big of an area can I use the Germbot™ on? You will need to experiment with this as a lot depends on your room layout. What should I do if the Germbot™ is not working correctly?